The Supernova E3 triple was introduced late 2008. At that time it was said to be 550 lumen. Later improvements by virtue of using newer LEDs (Possibly also a tuning circuit? Well, probably not due to size limitations in the housing Supernova uses) have resulted in claimed light ouput of 680 lumen (ca. Sept. 2009) and in late 2010, 800 lumen. As with all Supernova figures, these are datasheet values which don't take into account the losses in the lens, nor that LEDs often don't achieve the datasheet values. Esp. the Cree XP-G has been bad in this respect. 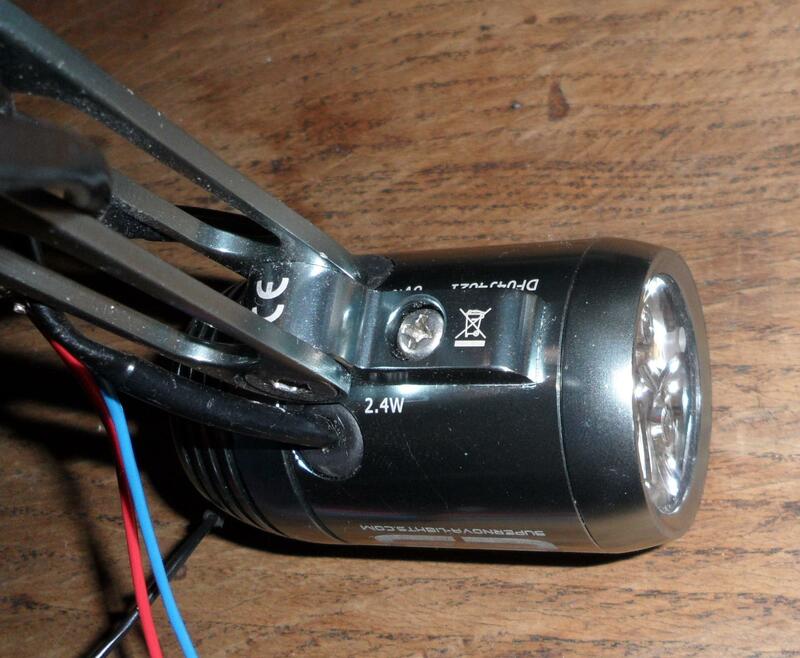 The latest E3 pro with asymmetric lens, non StVZO with XP-G LED (the supposed 370 lumen version, not listed on their pricelist but it is available from their webshop) was measured at just 140 lumen at 20 km/h (see http://www.enhydralutris.de: E3 pro (in German)), which is no better than the old version with a Cree XR-E Q5 from 2008. Assuming the electronics have changed so more power is extracted at high speed, I still think it will never get above say 240 lm maximum because the XP-G R5 in real world measurements with calibrated test equipment only produces ca. 275 lumen at 1 A (you still need to deduct losses from the lens from that!). Although it could be possible they are employing a current tripler as the XP-G is rated for 1.5 A but I don't believe they do this. For more on this see my StVZO page. The latest version of the E3 triple which they're advertising at 800 lumen was measured at just ca. 330 lumen at 30 km/h and 345 lumen at 40 km/h (see http://www.enhydralutris.de: E3 triple (in German)) which is of course nowhere near 800. Assuming they are again using datasheet values without taking losses in the lens into account this means 266 lumen per LED, which would be, according to Cree, reached at ca. 0.72A, but when taking into account the deviations of the XP-G from the datasheets, the light output would more likely be 3x 220 lumen. Deduce 10% optical losses and you have 594 lumen. It's not even close to that! 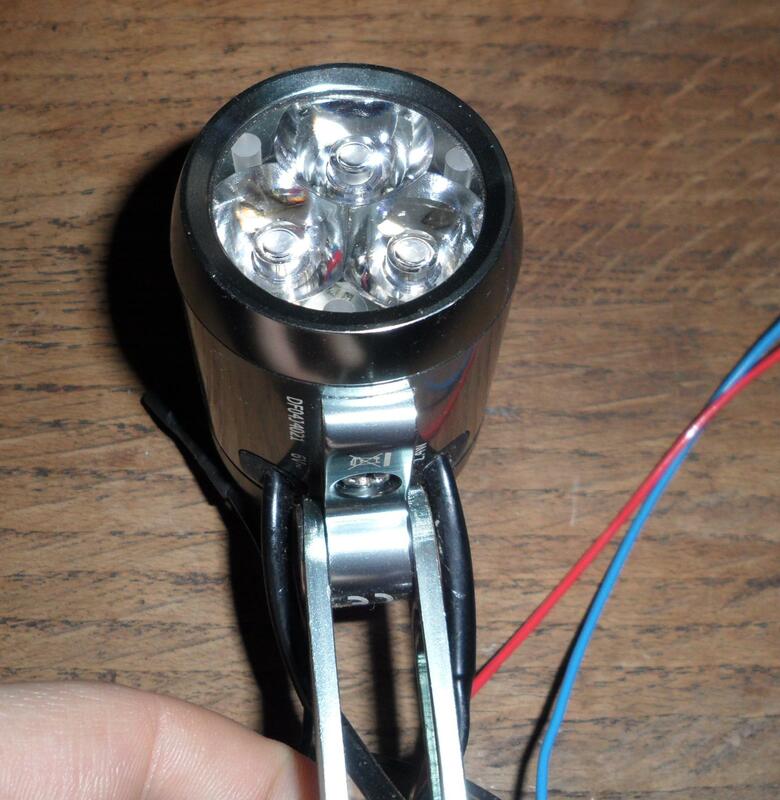 Assuming that the lamp just gets 0.50 A from the dynamo, we can expect 150 lumen per LED (http://www.mtb-news.de/forum/showpost.php?p=6822716&postcount=1087) so 450 lm in total, deduct 15% optical losses and we get to 382 lumen. Well well, that's not too far from the measured 345 lm at 40 km/h. It seems Supernova uses fairy tale current values to calculate the lightcurrent. Oh btw, they initially (2008) also claimed on their website/pricelist that an asymmetrical version was an option. When I asked about this, late 2008, they said it would take 2-3 years at least for this lens to be available. Why mention it at all then!?! can only be powered with 600 mA max. Note that with 4 LEDs you can easily get more light than with 3 LEDs, but with 4 LEDs you will need to switch off 1 core (or better yet 2 cores) at low speed, otherwise there's no light at low speed. As the E3-triple does something similar anyway with at first only 1 LED being on (which really isn't necessary with 3 LEDs, as the Ktronik lamp shows), and only at higher speed with all 3 LEDs powered, his reply isn't valid. I have made a picture of this one LED being on btw, which will be uploaded soon. I've shown this part of the reply for the statement that the E3-triple runs at what the dynamo delivers, which can be up to 600 mA (but more usually it's 500 mA). So, assuming no tuning circuit (as he says 600 mA max; one can sort of deduce this as in the housing of the E3-triple there really isn't enough room for a tuning circuit with capacitors), then with 3x Cree XR-E Q5 you could get ca. 162 lumen x 3 (Cree datasheet values) = 486 lm, minus 10% optical losses = 437 lm (with 15% optical losses you'd get 413 lm). So, using only datasheet values and the minimal expected losses you could at best get ca. 437 lumen from the 2008 E3-triple, not 550. But of course, even the 2010 version with XP-G LEDs doesn't reach 437 lm... If one assumes the dynamo with the E3-triple load (which is not purely resistive as no LED lamp is) delivers just 500 mA, then 3x XR-E Q5 would reach about 3x 141 lumen (datasheet value, the real value is undoubtedly lower) = 423 lm. Subtract the minimal optical losses of 10% and one gets 381 lm. With 15% it's 360 lm (almost certainly too high because of those optimistic datasheet values of the LEDs). This again is not even reached in the 2010 version with XP-Gs which emphasizes the fact that the Supernova dynamo lamps just don't get anywhere near to what's possible with a dynamo. Another example is the M33, which is claimed to be 1400 lumen running 3 XP-Gs at 1.5 A each, but given the measurements by 'Siam' which show the XP-G R5 to produce just ca. 272 lumen at 1A, at 1.5 A we can probably expect (using the curve given by Cree which says that at 1.5 A the output is about 1.34x that at 1.0A) ca. 364 lumen (oh, I later saw Siam measured the XP-G R5 at 1.5A where it produced 350 lm, so close to my estimate). 3 LEDs means 1092 lumen. Deduct 10% optical losses: 983 lumen. Well, recently it was measured (IBC forum (mtb-news.de): Stunde der Wahrheit) at 839 lumen, so another 15% lower than that. Perhaps here as with the Airstream they calculate power through the LEDs by power taken from the batteries or something like that, so not taking the losses in the driver into account. I can hardly believe it, but this is the method they seem to use to calculate the lumen output of the Airstream, so on the other hand it wouldn't surprise me one bit :-) But I guess it's more likely the junction temperature is simply much higher than 25°C, and at 80° (pretty high!) this would explain the 15% difference. And in case you didn't realise it, the section title is "The fairy tale of the Supernova-lumen" because of supernova's nonsensical story about "the fairy tale of the lux" on their website, see here for more on why lux ratings matter (summary: High lux rating = long throw for StVZO headlamps). Mass: ca. 148 g. including multimount and cables to dynamo and rear lamp. Size: width: ca. 40.0 mm, length: ca. 66.0 mm (the button sticks out another ca. 3 mm). Wiring: Double strand wire to the dynamo and to the rear lamp. 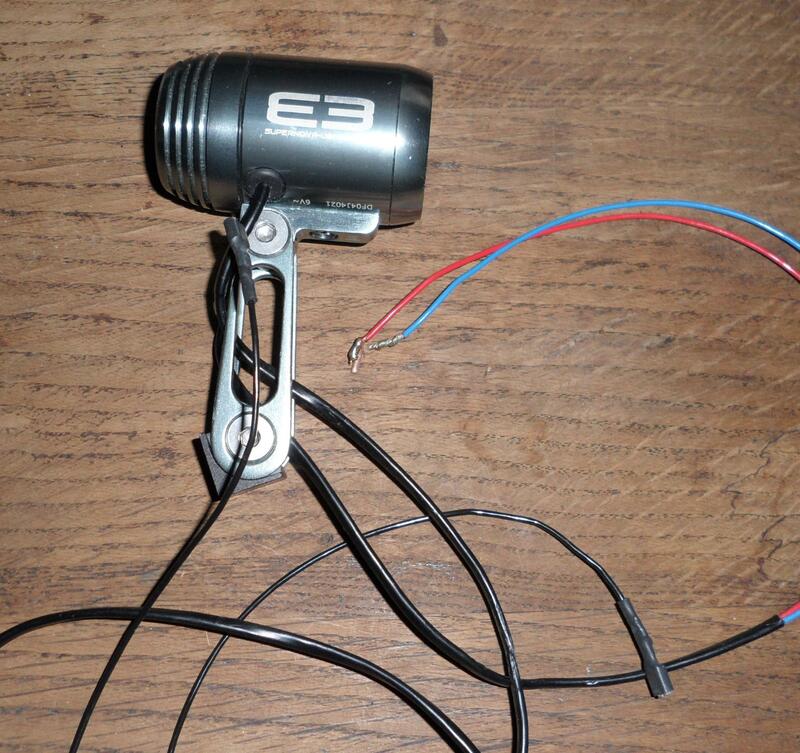 You need to attach connectors for the rear lamp cable yourself (male 2.8mm plugs to use standard rear-lamp cables). On/off: The lamp has a button at the rear to switch it on or off. This version I have on loan comes with the multimount which is quite nice. One problem though is that the black part of the multimount through which the bolt through the fork crown goes, is M6-threaded. This means you can't properly use it on a fork crown that is itself M6 threaded (and not just a hole through which an M6 bolt goes) which some of them are, e.g. as in my Koga World traveller. The lamp itself is in the same housing as the E3/E3 pro which is solid and very well made. The button is fairly heavy going and in the cold it's not that easy to feel if you switched it or not, same as with the E3-pro-StVZO and Philips SLD. As I remarked with the Philips SLD, I would really like to see an automatic on/off, for any headlamp, that one can set the sensitivity of. That should dispense with button pushing... And to switch the lamp completely off a rotating switch such as in the Edelux would be nice. Mounted on a bike where I usually have an Edelux or Philips SLD mounted, it seems very very dim. There's no way this lamp produces anywhere near 550 lumen (not surprising, as even the 2010 version with XP-Gs doesn't reach more than ca. 345 lumen in Olaf Schultz' measurements). 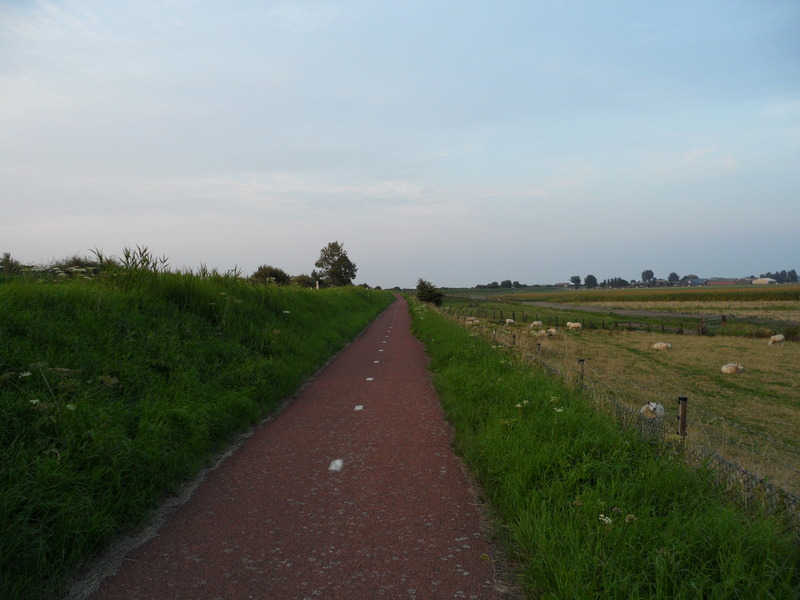 Retroreflective markers on the left and right at 25,50,75 m. Small white sticks at 10 and 15 m on the virtual lines through the white dots. I set the camera to make 8 Mp pictures instead of 14Mp. The latter gives huge pictures but not much extra information as large pictures are somewhat blurry at the pixel level with my camera (as with almost all compact cameras). The pictures don't show what I experience particularly well. 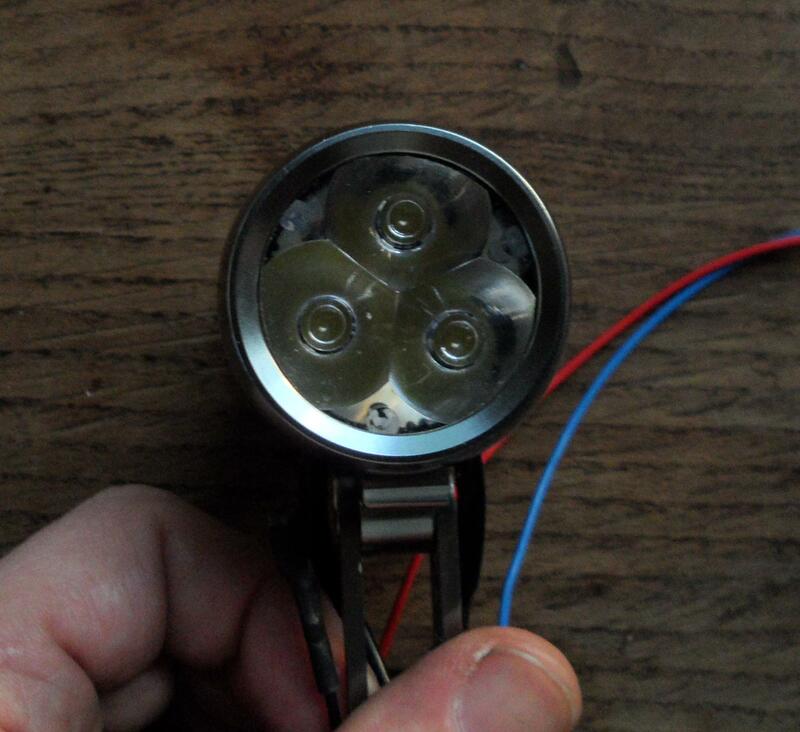 For more analysis of the beamshots of the other lamps see the E3-pro-StVZO review page. All pictures are quite dark compared to a dry/ice free road: compare the Philips pictures with earlier ones I made on a dry road 2 and you will see how much dimmer and how much reduced the throw is... So, I will probably remake the beamshots soon (hopefully there will be a few dry warmer days soon). The E3-triple from 2009 is very very dim and there is no way it produces 550 lumen. But this was clear beforehand, just as with the inflated lumen claim of the E3-pro-StVZO. Note: the road was wet, it was drizzling a little, later it rained harder. Beamshots made at 4s and at 8s exposure. The 8s duration was used because the road was wet which should give a dimmer view compared to my regular beamshots on dry roads, but also to better show the actual beam shape (for example, in my beamshot of the Cyo RT on a dry road 2, the beam shape is not at all clear and would need longer exposure). In future I will probably make beamshots at 4s and 8s for all beamshots. Retroreflective markers on the left and right at 25,50 m (you can't see them well in the beamshots because of the drizzle). Small white sticks at 10 and 15 m on the sides of the road. There are also white square distance markers with the distance written on them but they fell over in the wind :) They are at 10 m and 20 m (you can see those, the 25 m reflective marker is on a triangular shape that you can see a little further than this second distance marker). Problem with these markers is to keep them light and small and still have them stay upright in windy conditions. I'm already taking loads of gear with me on beamshot sessions... I'm not sure yet how to make a good and yet light base for the markers. The E3-triple has a very dim illumination at longer distances (25m and more) whereas the Philips SLD illuminates up to more than 50 m on this road. 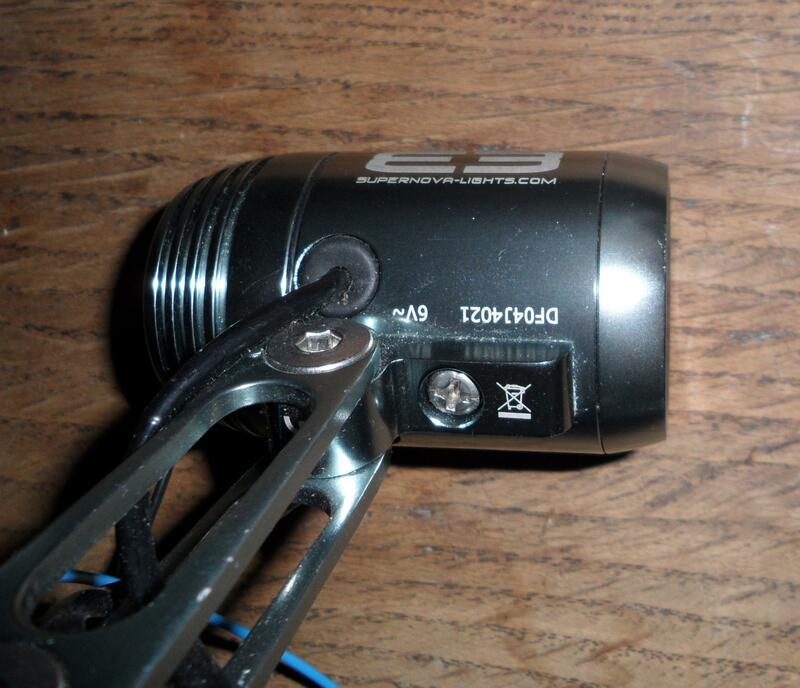 The E3-pro-StVZO also doesn't light up the distances from 25-50 m on the road well, it's pretty dim there. The E3-triple-2009 is worse than both these lamps which is unsurprising considering my experiences with symmetric beam lamps which show a symmetric beam must have about 3 to 4 times the light output of a good asymmetric beam to light up the road just as well. And as you can expect the triple to perhaps produce 270 lumen (an estimate which is taking into account that the 2010 version with XP-Gs that's advertised as 800 lumen produces about 345 at best), it should be equal to a headlamp with cutoff of about 70-90 lumen, so less than half the amount of light of an Edelux. I think that's a fair estimate as the Edelux/E3 pro/Philips SLD are a lot better for use on the road. Also note that the Magicshine MJ808, which produces ca. 550 lumen (measured) is much much brighter than the E3 triple (brighter in the sense of both the maximum illumination (hotspot) but also the amount of light that goes to the sides of the road, where the Magicshine puts out a lot more light too). If you want more evidence that the E3-triple-2009 produces far less than 550 lumen, well, I can't make beamshots of the Magicshine as I don't have one on loan any more, but the Magicshine, just as the Ktronik Triple XP-G give a 'wow!' feeling (because you get the feeling of riding in daylight), the E3-triple-2009 gives a 'hmm, less bright than my standard dynamo lamp' feeling. Again, for an analysis of the E3-pro-StVZO/Philips images and how they compare/differ to the earlier beamshots on road 2 with a thin ice layer, see the E3-pro-StVZO review page. Nicely made, nice housing and I like the multimount. For use on public roads, a regular headlamp with cutoff gives much more useful light and for MTB use the lamp seems to me far too dim. The 2010 version is undoubtedly better for MTB riding, but not much better considering the light measurements of Olaf Schultz (max. ca. 345 lumen). So, the E3-triple doesn't get anything near what's possible out of a dynamo setup. If you want a dynamo powered lamp with symmetric beam, getting a Ktronik triple XP-G (or triple XP-E for more throw and not much less light output) is a much better choice that will give a lot more light than this 2009 version of the E3-triple (I estimate the Ktronik triple XP-G at a real 550 lumen in a certain speed range, using the right tuning capacitors), and the Ktronik lamps are almost certainly also much brighter than the 2010 version of the Brown-dwarf E3-triple, eh, sorry, Supernova E3-triple.